Yes it's been 20 years since the release of Do the Right Thing and the question still remains: Did Mookie do the right thing? Two decades later, it feels humiliating to watch Buggin Out beg a white man to put a black picture on his personal Wall of Fame. Why didn’t he just open his own damn restaurant? 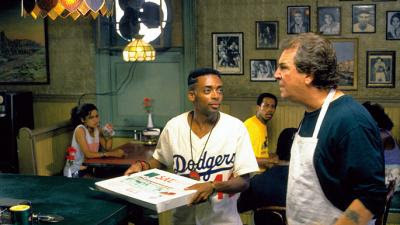 Can you believe ‘Do The Right Thing’ is 20 years old? The film’s promise of a United States of Black America was a nice fantasy. But now it’s time to welcome Sal back to the neighborhood. Let's just say the excerpt you just read from Hopkinson's blog is an interesting perspective, given the fact that the setting of the movie had nothing to do with black youth feeling alienated by living in white suburbia. Hopkinson growing up in suburban Indianapolis seems to be far removed from the struggles the young characters in the movie faced to survive in urban America. Have things gotten better in the last 20 years? Now you know why Mookie threw the trash can through the window and kicked off the riot in the film. As Malcolm X said more than 40 years ago, "There can't be Black-White unity until there is first some Black unity." ...and as Samuel Jackson's Disc Jockey character in the movie would have said, That's the Triple Truth, RUTH! Watch Do the Right Thing on youtube.